St Martin will captivate you from the moment your captain moors your yacht and you skip ashore. The Dutch side, with the capital Philipsburg, is known for its many glittering jewellery stores, its lively nightspots and bustling casinos. The French side, with its capital, Marigot, is better known for its restaurants and gourmet cuisine. 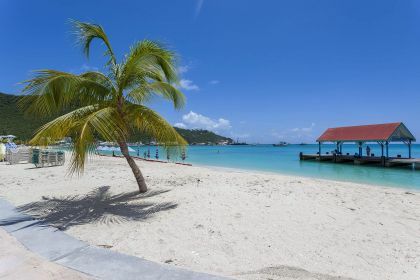 Ever considered visiting St Martin? Or how about St Maarten? 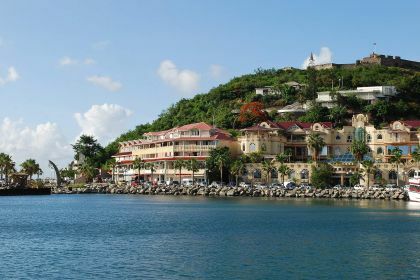 If you fancy your vacation in two languages, then this island — part of the Caribbean’s Leeward Islands — is sure to fascinate. 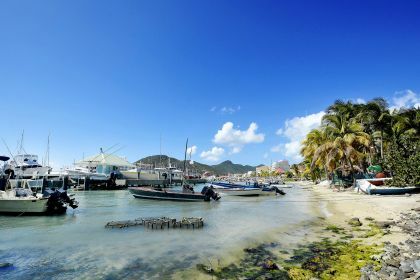 The islands have the rather interesting distinction of being half French and half Dutch: its northern French side is called Saint Martin, while its southern Dutch side is called Sint Maarten. The island is home to bustling resort beaches as well as isolated coves for some much-needed downtime. It's also known for its fusion cooking, vibrant nightlife and duty-free shops. Whichever name you prefer to call it, though, St Martin will captivate you from the moment you moor your yacht and skip ashore. The French side, meanwhile, will impress you with its fine-dining gems in Marigot and Grand Case. On the menu are Grand Case’s Bistrot Caraibes, considered the best restaurant on St Martin, as are the highly recommended restaurants L’Auberge Gourmande, La Villa Restaurant, Le Pressoir and Le Cottage. Bistrot Caraibes is famous for its lobsters. Here you can take advantage of the rather quaint novelty of choosing your lobster, having a picture taken with it, and then having the photograph emailed to you. At L’Auberge Gourmande, you will not only be greeted at the door with a glass of chilled bubbly, but also dazzled by an exotic menu featuring delectable duck, sole, and, for the adventurous eaters, frogs’ legs. La Villa Restaurant serves a memorable French onion soup, among its many other mouthwatering dishes and desserts. Little Jerusalem, meanwhile, is known for its sumptuous Israeli cuisine. Both sides showcase some of the best beaches in the Caribbean and invigorating water sports. Unsure which beach will suit you best? The only way to find out is cruise around the island on your luxury yacht and enjoy exploring its shoreline and many secret coves. Maho beach is best known by plane-spotters with the international airport lying directly adjacent to the beach. Beachgoers often cheer as planes land! Besides this novelty factor, however, Maho beach is small and very pretty. 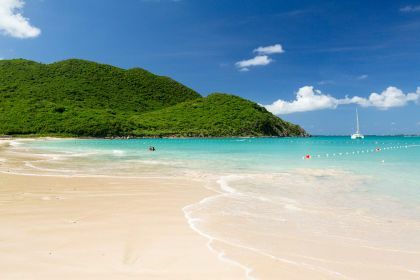 Orient Bay Beach is a postcard-perfect representation of the Caribbean: think swaying palms and blinding white sand. It also has strong winds, so is a major draw-card with kite and windsurfers. Mullet Bay, meanwhile, on the island’s southwestern coast offers great active surf, making this an attractive spot for local surfers. Fancy a round of golf? The exclusive Mullet Bay Golf Course is also close by. And if a flutter on the roulette tables is more your thing, Grand Casino Mullet Bay, Casino Royale and Atlantis World Casino are less than half a mile away. Diamonds are usually high on the list of shoppers in St Martin. It’s a haven for those in search of serious retail therapy or wanting to make a good investment. Caribbean Gems, Shopping Haven and Joe’s Jewelry in Philipsburg are considered reputable diamond retailers if you’re hunting for that special bargain. Experienced jewellers are on hand to advise you on just the right stone you’re looking for, on having bespoke jewellery items made or purchasing the luxury watch of your dreams. If you’re keen to sample some of its celebrated nightlife, the Red Piano Bar in Simpson Bay is a great spot to kick off the evening. It’s got all the elements you need for a memorable night out: stylish décor, great music, a dance floor and a pool table. A live band takes requests and the bar quickly has its patrons showing off their moves on the dance floor. Sopranos Piano Bar in Maho is another notable party venue, drawing loyal patrons with its top-notch live music. The list of hotspots goes on… St Martin is known as the party island for good reason. It’s just the place for you, if you’re hankering to put your party shoes on. The charms of St Martin are seemingly endless, and diverse: a butterfly farm, hiking trails, iguanas, a perfume-making workshop at Tijon Parfumerie, and so much more, are on the agenda, waiting for you to experience and explore. Contact your friendly Abberley charter broker here or call us, and we’ll help you plan a perfect luxury yacht vacation to the Caribbean island of St Martin.